Button Bear is so cute. He is so full of fun! 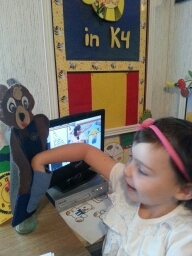 He and Amber Lamb, the Mascots for K4, bring such a love of learning – they make Mom/teacher’s job easy. No doubt, this would be a very controversial statement for some, but hear goes – it’s on a magnet on our refrigerator: “Every Child is Homeschooled!” There are truly many gems of truth surrounding that statement; however, one is that no matter if a child goes to a traditional school or whether they are officially homeschooled, or perhaps even their family is determined to follow the “unschooling” motto, a child is “schooled” in some way, at home, since their birth day. That being said, by default, it is the parent who teaches, trains, and develops a love of learning (or the lack thereof) in each of their children. 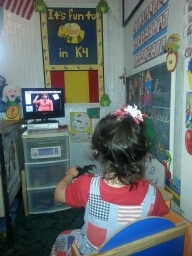 Up to this point, in our homeschooling history, we have exerted much effort to create of love of learning in AbiNoelle. So far, so good….and all the more so with Amber Lamb and Button Bear. 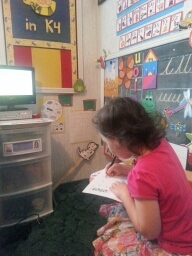 This second week of school was a little challenging with VBS at church delaying our typical 8:30 bedtime by two hours. That morning alarm was shocked by a very groggy little girl, who struggled to find her usually peppy self. So this week’s scenario required the police and pardon response! Yes, we were tired; however if we skipped homeschooling every time a different circumstance gave excuse, we wouldn’t even be able to fulfill our required duties if we did year-’round school. On the other hand, a lack of sleep is definitely detrimental to learning. So…we policed – WE STAYED DETERMINED TO COMPLETE FIVE DAYS OF SCHOOL; and we pardoned – WE STARTED EACH MORNING AN HOUR AND HALF LATER. Because of being a former Christian school teacher, we often compare our homeschooling efforts with the school structure. Not long ago, we read of a Christian school who started the morning after their mid-week church service an hour later. What a great way to “pardon” both student and teacher. Schedules do get hectic in this constantly moving life. 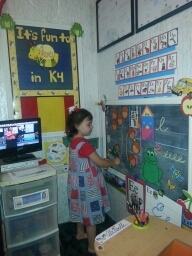 The ability to adjust the schedule while fulfilling duties, is a wonderful advantage of homeschooling. With schedules in check, pardons ordered, and lots of fun infused – the week was a great success. Little Miss Muffet fun with the class during Poetry – Watch here as we play this poem! 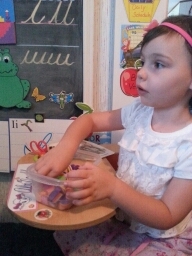 Listening to Mrs. Pintar and counting the correct number of objects. 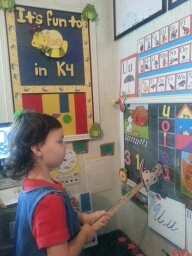 Helping Sparky say the vowel sounds on the ladder. 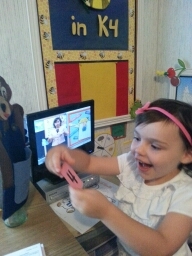 Click here to see The Vowel Chart Song! 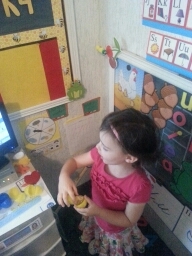 The egg hatched in phonics time! Hatching the eggs in Phonics time was a fun way to practice letter sounds. Twinkle, Twinkle Traffic Light Song – 15 sec. Listen to this cute song! Love singing with Mrs. Pintar!